In 2016, the Chinese government abandoned its one-child policy, allowing all couples to have two children. Growing up, we only children had many different labels. Little emperors, little princesses and selfish narcissists were just some of them. We were told we had “big ego and low ability”, and that we were destined to become a “lost generation” because we were “spoiled” and never had to share the love, care and material comfort provided by our parents and grandparents. As the single-child family gradually became the norm, people started to forget that in the 1960s big families were the rule rather than the exception, with an average of six babies for each woman. China’s economic miracleinspired awe around the world, though it came at a price: skyrocketing housing, living and education costs. As a result, over the past decades, a growing part of my generation, especially those living in cities, is increasingly hesitant to start a family. During my lifetime, the government has faced mounting pressures: an ageing society and a shrinking workforce, as well as the alarming gender imbalance due to selective abortion, which was technically illegal but practised underground by families who only had one chance to have a male child. In 2016, it raised the limit to two children per household. However, the expected baby boom didn’t materialise. According to China’s National Bureau of Statistics, only 17.9 million babies were born in 2016, half the number expected. In 2017, the number fell to 17.2 million. As economic growth continues to slow down, no one would be surprised if the leadership decides to fully lift the birth restrictions that have lasted for nearly four decades. According to a brief statement released in August by the National People’s Congress, a new draft revision of the country’s civil code “will no longer retain the relevant provisions of family planning … considering the changes in the country’s demographic situation”. And in September, three offices responsible for the implementation of family planning policies were removed from the new structure of China’s national health commission. So, is the state finally moving out of people’s bedrooms? Unfortunately not. Rather, its interference is developing a different slant. At the regional level, some government agencies have now adopted restrictions on abortion. In one province, women more than 14 weeks pregnant will need to obtain three signatures from medical personnel in order to have a termination. And two other provinces have made it harder for couples to divorce, because they are more likely to have babies if they stay together. Recently two academics caused a social-media storm with an article in a provincial Communist party newspaper proposing a tax-like “maternity fund”. Couples with fewer than two children would have to pay into the fund, only getting their money back when they give birth to a second child – or when they retire, if that doesn’t happen. And at the same time, People’s Daily, the mouthpiece of the ruling Communist party, ran a commentary headlined “Giving birth is a family matter and also a national issue”, which warned that “the impact of low birth rates on the economy and society has begun to show”. Its tone reminded me of the dystopian novel The Handmaid’s Tale, in which women’s reproductive choices are controlled by the state. It made me picture the novel’s terrifying scenes of female characters, like walking wombs, impassively repeating, “Blessed be the fruit”. For Chinese people of my generation, these proposals bring back memories of the severe penalties for those who gave birth to more than one child between 1979 and 2016, and the climate of fear that affected so many, including my parents. If the “maternity fund” is adopted, my generation will again become the subject of one of history’s biggest social experiments – punished for having too many children when the nation didn’t need them, and punished for not producing enough when it does. What hasn’t changed is tying citizens’ reproductive behaviour to the strategic goals of the state, with no respect for people’s individual rights. For many people of my age, it would be unrealistic to have a large family even if we wanted to. As the only children, our parents’ expectations for us, academically and professionally, have been overwhelming. Now, we are asked to take care of four elders and several children at the same time? The price tag of raising children in today’s China is huge, let alone our fears about bringing children into a society that offers them defective vaccines and toxic baby formula, air pollution and abuse in kindergartens, and a lack of transparency and press freedom. Chinese people are good at reading hidden messages. The design for China’s new zodiac-themed postage stamp for the year of the pig in 2019 was released recently. It features two adult pigs with three happy piglets. A similar commemorative stamp marking the year of the monkey two years ago had two baby monkeys. Its release coincided exactly with the replacement of the one-child policy with the “two-child policy”. But we are not pigs or monkeys. As a notoriously self-centred generation, we cherish our rights more than ever – including the right to get married, or not; to divorce, or not; to have as many children as we want, or none. After all, we weren’t called the loneliest generation for nothing. If individualism is ever going to take root in a society with a long history of collectivism, it will be my generation that makes it happen. … please help us protect independent journalism at a time when factual, trustworthy reporting is under threat by making a year-end gift to support The Guardian. We’re asking our US readers to help us raise one million dollars by the new year so that we can report on the stories that matter in 2019. Small or big, every contribution will help us reach our goal. The Guardian’s independence means that we can report on the stories that matter and pursue difficult investigations, challenging the powerful and holding them to account. No one edits our editor. No one steers our opinion. Our journalists have the freedom to report on the facts, with no commercial bias and without politicians or shareholders influencing their work. As 2019 approaches, we would like to ask for your ongoing support. Reaching our year-end target will ensure that we can keep delivering factual reporting at a critical time in US history. In an era of disinformation campaigns and partisan bots, trustworthy news sources that sort facts from lies are under threat like never before. With the free press and individual journalists increasingly under attack, The Guardian is committed to exposing wrongdoing and uncovering the truth. We are living in confusing times and understand that it can be tempting to turn away from news coverage. But we hope you feel, as we do, that we have to make sense of the world if we’re going to have a chance of making it a better place. Our approach allows us to keep our factual journalism open to everyone, regardless of where they live or what they can afford. We are so encouraged by the support we have already received from our readers, and we want to say thank you. But we need many more readers to join for each year to come. By giving a year-end gift – however big or small – you are supporting The Guardian’s independence and ensuring we can keep delivering factual, trustworthy journalism for the years to come. Thank you. 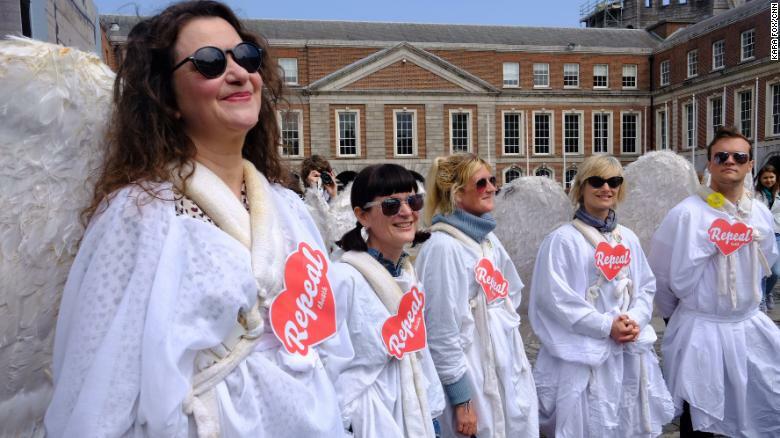 Dublin, Ireland (CNN) Ireland has voted an emphatic “Yes” to amend the country’s constitution to enable legislation that would allow women to have an abortion in a historic and emotionally charged referendum. “Yes” supporters wait for the final results Saturday at Dublin Castle. 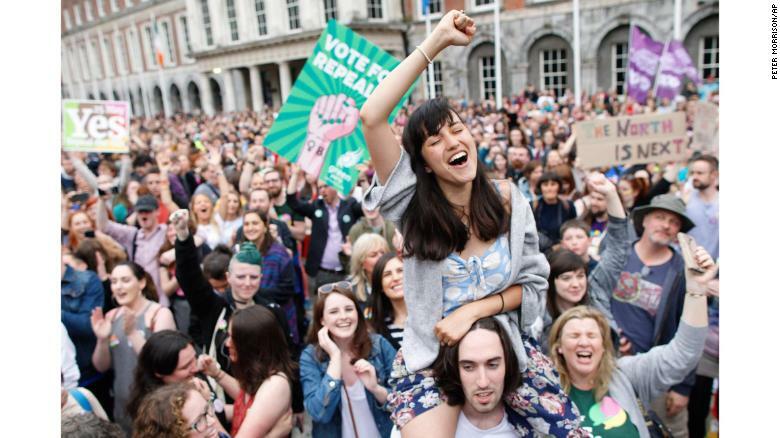 A woman from the “Yes” campaign reacts after final results were announced Saturday at Dublin Castle. 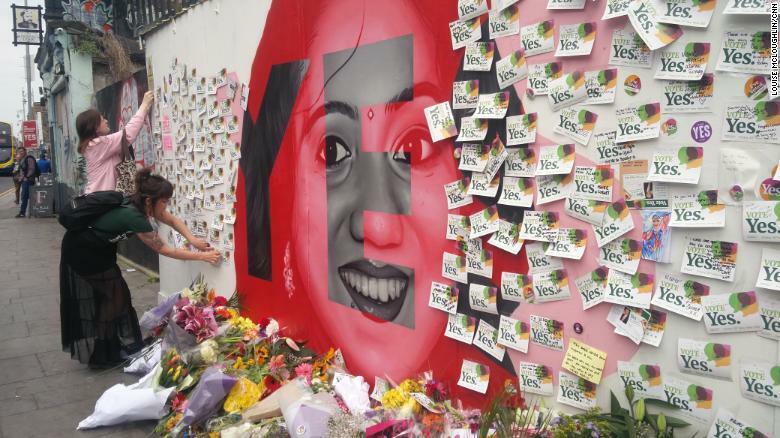 Repeal supporters leave notes at a mural of Savita Halappanavar, whose death sparked the campaign. CNN’s Hilary Clarke wrote from London, while Kara Fox reported from Dublin. CNN’s Muhammad Darwish and Laura Perez Maestro contributed to this report.